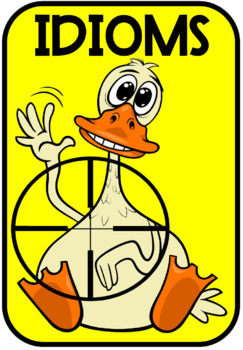 Here I have a set of 50 Visual Flashcards in a very fun and colorful theme for learning Idioms. Have you ever stopped to hear just how many idioms we say in the course of our day-to-day conversations with others? Is your class ready to learn this fun form of spoken English? 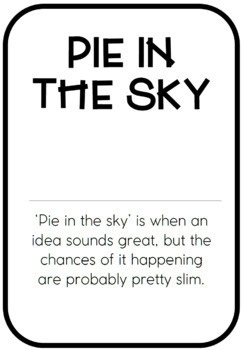 Idioms are not only a lot of fun, but also often quite funny too. This set of 50 flashcards come ready to just print in full color (double-sided) and be laminated ready to use straightaway. 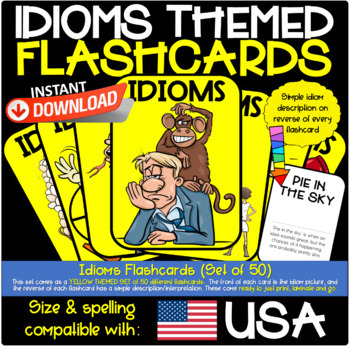 Each of the 50 individual idioms used in this set are shown at the bottom of this listing. I have set up the PDF document so that the reverse of each card is already flipped so that you don’t have to adjust anything when it’s time to print, so that you get both sides of these cards the printing the “right way up” on BOTH sides. So please don’t be alarmed if you purchase this product and upon opening it you see the picture side of the card the right way up, and its reverse upside-down. This aspect is going to make your life so much easier when it comes time to print them. The set is in a USA compatible PDF size, and it has two flashcards per page (double-sided). The exact dimension of each flashcard is 7.44 inches (H) x 5.07 inches (W). This is a great size to be able to sit in front of your class and hold them up in a way that they will be visible by all students, and not just ones sitting close to the front of the class. The sky’s the limit with the fun you can have with these with your students. Each card has the title “Idioms” on its front and accompanies a fun, engaging clipart. The reverse of the flashcard has in big bold font the title of the idiom and underneath in a smaller, crisper font is its meaning in plain English. Please refer to some of my included photos of these flashcards for an example of how they look (although please note, TpT allow a maximum of 4 photos per listing). Please be sure to click on each image for a clear resolution photo, as the thumbnail versions do not offer a quality visual of the items. These flashcards are also available in other sizes and formats and even a Mega Bundle. 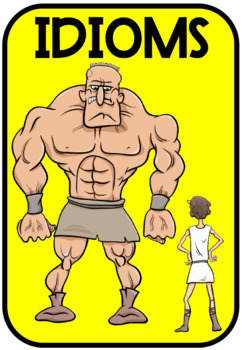 Check out the various Idioms resources I have on offer by clicking HERE. Thank you for visiting Love My Printables!